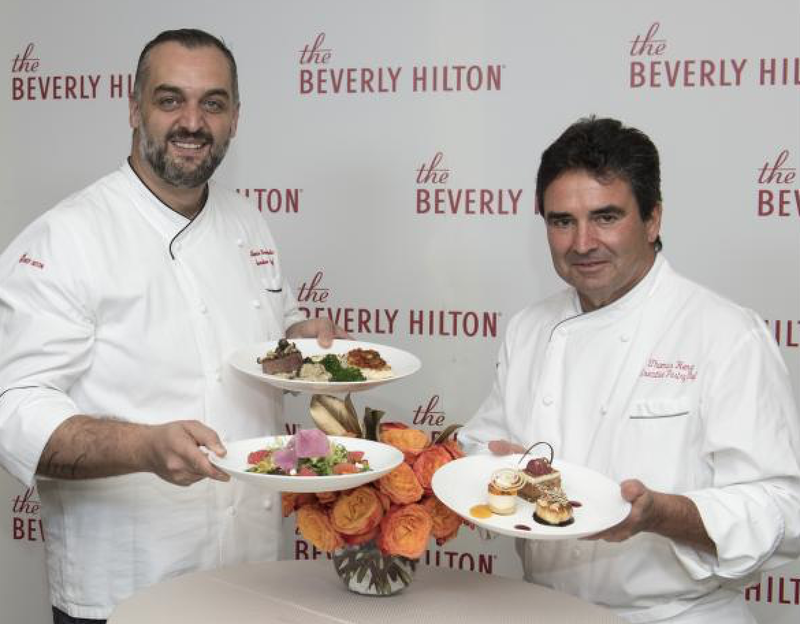 The Beverly Hilton's Executive Chef Alberico Nunziata (Left) and Executive Pastry Chef Thomas Henzi (Right) announce the 74th Annual Golden Globe Awards Dinner and Dessert Menu during the annual Plate Up menu unveiling event at the Beverly Hilton in Los Angeles, California on Tuesday, January 3, 2017. The best part of a brand new year is AWARD SEASON which always kicks of with the Hollywood Foreign Press Association's annual Golden Globe Awards. While stylists are scrambling around L.A. (and sometimes the country or the globe) doing a billion fittings, publicists are emailing up a storm and the production teams are making sure everything is picture perfect, a pair of hard working chefs are getting their team ready for the star studded Golden Globes Dinner. On Tuesday, January 3, 2017 Executive Chef Alberico Nunziata and Executive Pastry Chef Thomas Henzi unveiled the 2017 Golden Globe menu to lucky press members at the Beverly Hilton Hotel in Los Angeles California. This year's menu theme is described by Nunziata as "Italian meets California' and according to Entertainment Tonight the theme will include more than 800 pounds of Chilean sea bass, 4,000 pounds of vegetables and 600 pounds of filet mignon with a mushroom risotto. These dishes are definitely divine enough for the Hollywood elite! The table is set for delicious food to be served to the stars during the 74th Annual Golden Globes on Sunday, January 8, 2017. 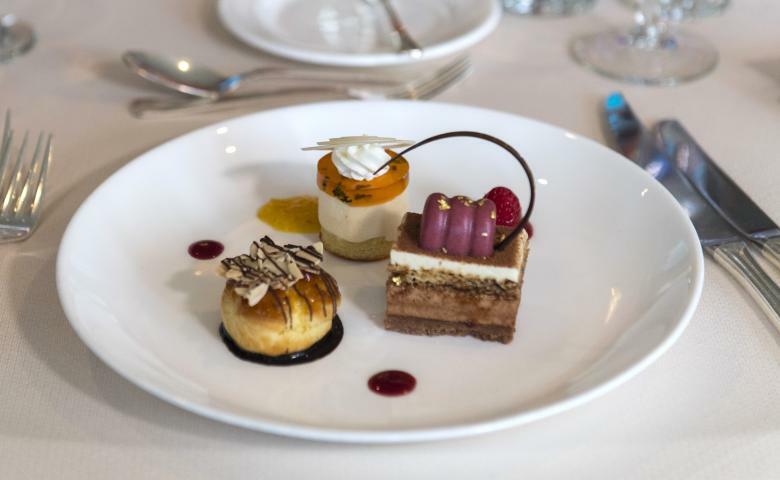 After a fabulous main course, Golden Globes' golden attendees will enjoy decadent desserts by the Beverly Hilton's Executive Pastry Chef Thomas Henzi for the 7th year in a row. Henri is preparing a dessert trio that will consist of Neapolitan almond cake with orange mascarpone, profiteroles filled with amaretto vanilla cream and chocolate gianduja crunch bars. YES, PLEASE AND THANK YOU! What more can you ask for then a room filled with stars and sweet treats by Beverly Hilton Executive Pastry Chef Thomas Henzi? 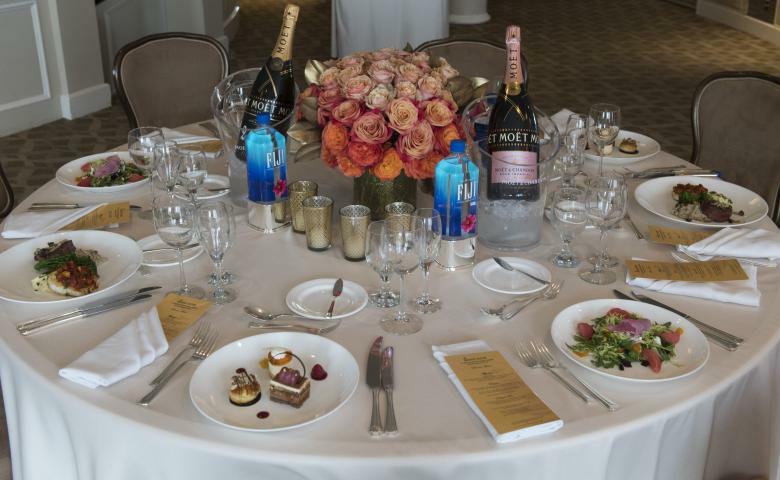 What would a fabulous dinner be without fabulous custom cocktails and champagne? 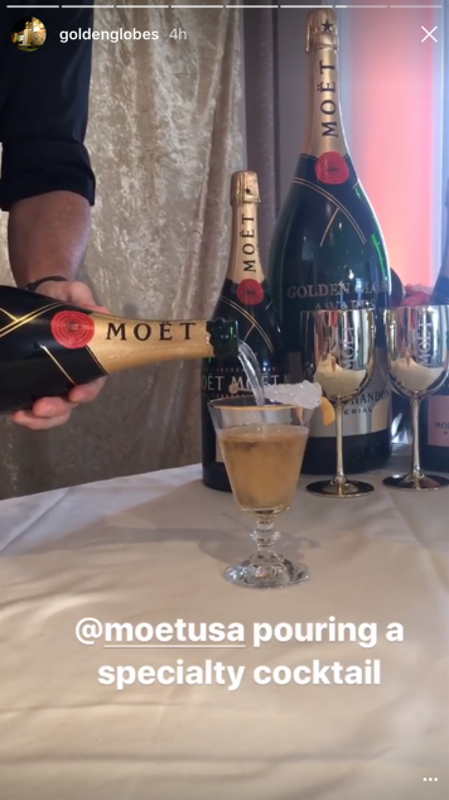 Moët & Chandon will once again be official champagne of the Golden Globes and will provide custom cocktails during a champagne reception before dinner. Entertainment Tonight reports that there will be 1,500 Moët minis, 500 signature cocktails and 125 cases of Moët & Chandon (Cheers indeed)! That's plenty of bubbles flowing during the awards show to loosen up our favorite celebs so they can give us those unforgettable Golden Globe moments that give us so much life and keep us Tweeting all night long! Delicious specialty cocktails that the stars will be imbibing on before the Golden Globes. Thanks Champagne! Congrats to both chefs for creating a fabulous menu for the 74th Annual Golden Globes! Feel free to save me a plate! The official Golden Globes dinner and dessert menu that will be seen by the top of Tinseltown! 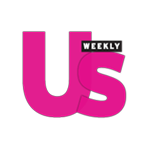 The Golden Globe Awards will be hosted by Jimmy Fallon (I wouldn't mind Tina Fey and Amy Poehler again) on Sunday, January 8th at 8 P.M. Eastern live on NBC.